Another of the many perks of homeschooling is that we get to have sick leaves without missing out on school lessons. Since our curriculum is based on our son’s pace, we are not pressured into completing anything at any particular time. That said, our son has been trained to make his own goals as he goes through each day. Unless the lesson for a subject came on a little challenging than usual, it is 20 pages per day for him these days. To give you an idea how we go about our homeschooling, here are a few of things that you will find in the curriculum that we use, particularly, Level 4 Social Studies PACE 1044. It’s the 8th of a series of 12 PACES for each subject of a Level 4 Student using this particular homeshcooling curicculum. To learn to accept whatever happens as God’s best for me – to be patient. One of the things that I especially appreciate about the School of Tomorrow curriculum is how it incorporates in a student’s goals values and Bible verse in each PACE. The above goals are written on the first page of the PACE. 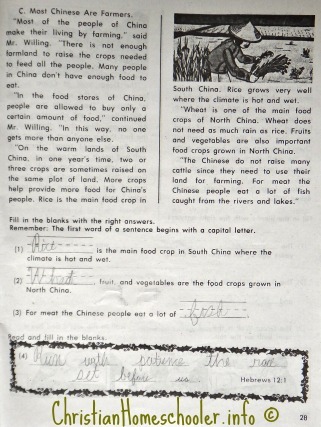 Our homeschooler was particularly enthusiastic last week as he went about learning about China, its people and language. 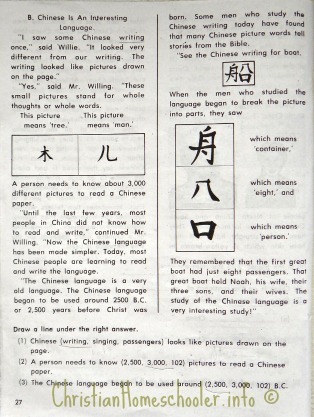 He was so amazed about learning that a person needs to know about 3,000 different pictures to read a Chinese paper. He also learned that similar to Vietnamese, a word’s meaning in Chinese becomes different when you use a different tone. He started to scribble words from the Chinese characters he learned. As homeschoolers of Philippine Christian School of Tomorrow, we also get to enjoy recognition days like regular traditional students and parents. We were not able to attend last year’s event since we were out of the country. But this time around, we are thrilled to be able to attend our very first homeschoolers banquet and awards night. 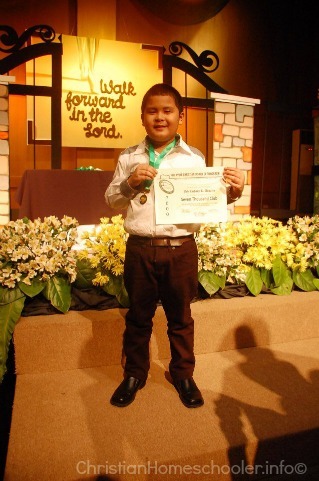 It was in 2010, when our homeschooler received 2 awards during his Preschool Graduation: Best in Sound Recognition and Most Number of Excellent Marks! This time around, for Level 3, Jed took home two awards: 7 Thousand Club Member and Honor A! Congratulations, son! 😀 If a student is a 7 Thousand Club Member, it means he has earned 70 100 scores during the school year, regardless of the number of levels he was able to finish. For last year, our son only finished 1. We are more than half way through Level 4. Unlike the previous years, Level 4 is already more complex. Pushing him to finish right away to make it to the cut off is not really worth it. Half-baked won’t cut it for these homeschoolers. For more than two months now, we have been holding our homeschool in another setup. Because after almost 4 years of homeschooling in a cramped corner, God has provided a way for us to level up and upgrade our homeschooling nook. Although the construction is still in progress, we are very grateful for a better learning environment for our homeschooler. 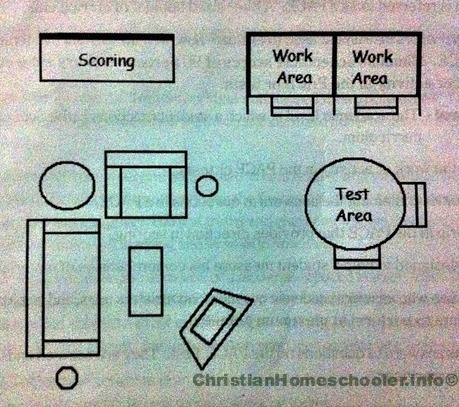 Above is the ideal set up for a homeschooling learning center. Whatever place you choose, make sure that it has good lighting. Provide a place in the room for small bulletin board where the student’s Goal Chart and Student Progress Chart can be displayed. Preferably fronting where the student works. If you have more than one student, each should have an individual work space. 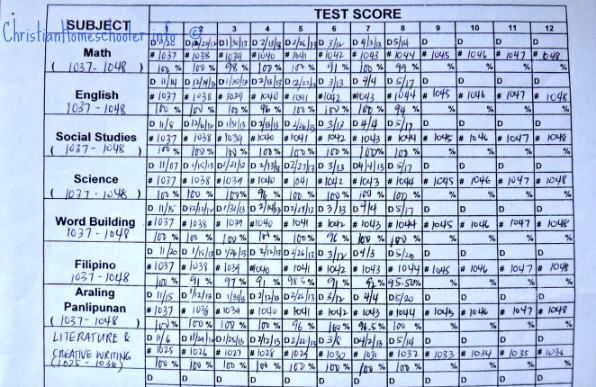 You need to provide a separate area where the student scores and tests. This could be a sewing machine table, a corner on the kitchen counter, a game table, etc. If available, choose an area that allows the student to stand upright. Whatever you choose, use it consistently. As weird as it may sound, our homeschool director is my husband. As my son’s homeschool supervisor, I facilitate our homeschooler as he does his everyday routine. But our director a.k.a. the husband also gets hands on and checks out our routine that I, at times, I tend to be lax at from time to time. 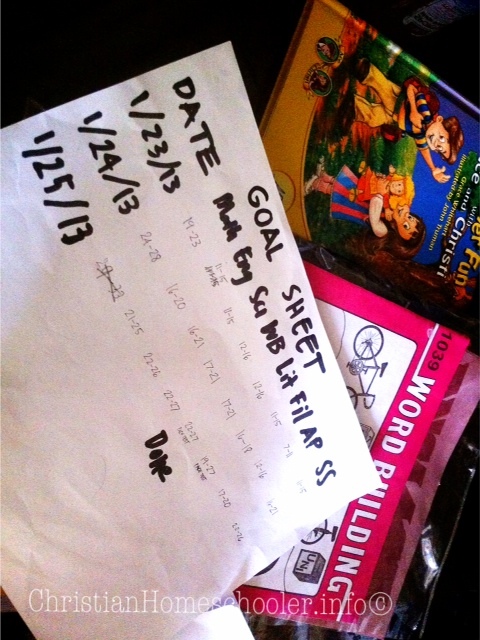 This week, “the director” checked out our homeschooler’s goals and how he has been keeping at it. Because we were not given a goal sheet for this level (I forgot to ask for a pad during the time we went to pick up our Level 4 materials), we have not been writing a visual goal and just got content with our virtual goal of doing 5 pages per pace.